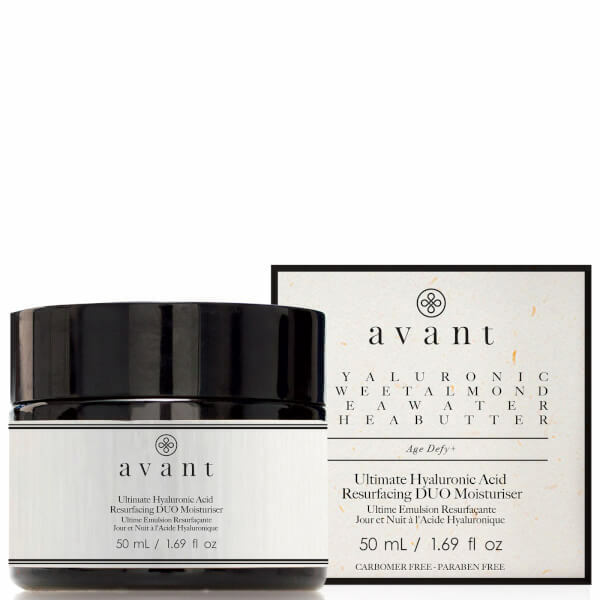 Brighten and smooth your complexion with Avant Skincare Ultimate Hyaluronic Acid Resurfacing Duo Moisturiser, a nourishing anti-ageing formula that works to resurface the skin for a youthful appearance. A soothing combination of Hyaluronic Acid, Shea Butter and Sweet Almond Oil tightens and firms the skin and restores moisture for a brighter, more even complexion. Antioxidant Vitamins A, B, D and E help to reduce the appearance of fine lines and wrinkles for a visibly younger-looking visage. Apply the moisturiser along the jaw, working from the chin towards the earlobes. Smooth from nose to temples. Massage across the forehead, making smoothing movements from the centre of the face outwards. Finally, make circular movements from eyebrows to nose, avoiding the eye contour area.